The Bessemer and Lake Erie Railroad is a route which connected the iron ore and coal docks at Conneaut on Lake Erie to the Mon Valley steel works owned by Andrew Carnegie. This portion of the railroad was opened in 1897 with the completion of the high bridge over the Allegheny River in Harmar (replaced 1918). Once the main line had been established many of the original structures were replaced in the twenty years which followed. 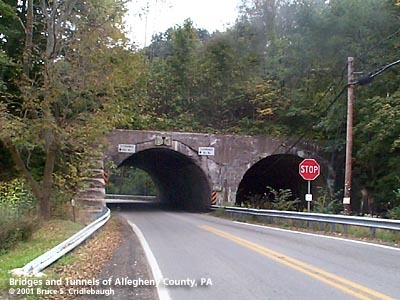 In Harmar Twp and Indiana Twp, three tunnels through embankments share similar design. Little Deer Creek Rd and Little Deer Creek pass through the main line embankment in side-by-side tunnels at Rural Ridge; Lafever Hill Rd passes below the main line just over a mile south; a now-abandoned spur to mines near Indianola another mile further south crosses an embankment with Rich Hill Rd and Little Deer Creek tunneling below in separate, but side-by-side structures. In all three locations the tunnels are concrete shells with impressions of the plank formwork still showing in the ceiling vaults. The basic shape of the roof is a gable outer surface with an inner circular arch. The portal were then squared to retain the embankment. Stepped wing walls extend from the portals. Indiana Twp. was settled as part of the Depreciation Lands -- land deeded to Revolutionary War veterans as payment for their services. The village of Rural Ridge expanded as a mining "patch," a town built to house the miners, with the operations beginning in 1922. Carnegie had been discussing rail transport with other lines, but determined the best way to protect his interests was to control the rail line himself. Several smaller companies had constructed sections of the route. "Bear Creek Railroad (name changed to Shenango and Allegheny Railroad Co.) was incorporated in March 1865 for the purpose of moving coal 21 miles from Pardoe to Shenango for delivery to other railroads and the Erie Extension Canal. By 1883, Shenango and Allegheny had extended north to Greenville, PA and south to Butler, PA. By 1892, the line had extended north to reach the port of Conneaut, OH. The extensions carried their own descriptive corporate names and survived a series of corporate reorganizations to become the Pittsburgh, Shenango and Lake Erie." The rail line had been completed as far as Butler, still 40 miles distant from the Mon Valley. "The first ore boat arrived in Conneaut in 1892 stimulating the interest of Andrew Carnegie. In April 1896, a tri-party agreement between PS&LE, Union Railroad Company and Carnegie Steel Company called for construction of a line from Butler to East Pittsburgh. The Butler and Pittsburgh Railroad Company incorporated April 8, 1896 and completed, spectacularly, by October 27, 1897 including a long, single track bridge across the Allegheny River. Also in 1897, PS&LE and B&P were consolidated into the Pittsburgh, Bessemer & Lake Erie under majority ownership of Carnegie." "Four years later, Carnegie formed the Bessemer and Lake Erie Railroad under this exclusive ownership and arranged to lease PS&LE for 999 years. This arrangement stayed in place with the formation of U. S. Steel in 1901, which bought out Carnegie interests." "In 1906, B&LE leased, and later sold, to Union Railroad the portion of line between North Bessemer and East Pittsburgh." "In 1988, the Bessemer & Lake Erie Railroad became part of Transtar, Inc. Transtar is a privately-held transportation holding company with principal operations in railroad freight transportation, dock operations, Great Lakes shipping, and inland river barging. The Transtar subsidiary companies formed over the years to meet the transportation needs of various steel making facilities that were the predecessors of today's USX Corporation. Prior to 1989, the Transtar companies were wholly owned transportation subsidiaries of USX (formerly United States Steel Corporation). In December 1988, these transportation companies were acquired by a new holding company, Transtar, Inc."
"In 2001, the Bessemer & Lake Erie Railroad became part of Great Lakes Transportation, a privately-held transportation holding company with principal operations in railroad freight transportation, dock operations and Great Lakes shipping." B&LE corporate website quoted passages; Indiana Township preliminary history book 1805, vol. 1. [Indianola, Pa.]: Indiana Township Historical Commission, c1988.